In 1793 John Patteson bought Charles Greeves’ brewery at Pockthorpe with a view to finding an occupation for his son. 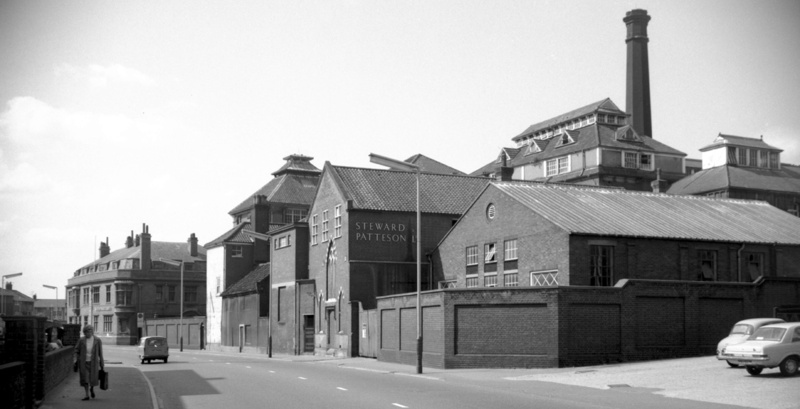 These innocuous beginnings laid the foundations for the firm of Steward & Patteson which by 1961 was one of the largest non-metropolitan breweries in the country. The brewery itself was originally knows as the Anchor Brewery, but by the end of the 1850s it had been rechristened as the Pockthorpe Brewery. By then the business had built a large tied estate which included 183 Norwich pubs. In the following century they continued to expand often aggressively taking over competitors not for their breweries, which were subsequently closed, but for their tied estates. By 1960 they owned over 1250 tied houses. In 1961, along with Bullards, the directors bought a half share in Morgans’ brewery. The two Norwich breweries split the tied estate between them and sold the brewery, which was superfluous to requirements, to Watney Mann. As part of the deal they entered into a trading agreement whereby Watney’s undertook to supply the Bullards’ and Steward & Patteson tied houses with keg beers such as ‘Red Barrel’. Before long Watneys were outselling the Norwich breweries in their own pubs. The deal had also left Steward & Patteson financially stretched and after years of being the hunter the tables were turned. By 1963 Watney’s owned 17% of Steward & Patteson’s ordinary shares and by 1967 they completed the purchase. The assurances by Watney Mann about the preservation of the Pockthorpe Brewery proved as genuine as those made by Steward & Patteson when they themselves took over brewing minnows, and on 27th January 1970 the last brew was made in Pockthorpe. The brewery was largely demolished between 1972 and 1974. However, the old brewery offices on Barrack Street have recently been renovated and restored.